Certification of Level I is provided once GSA certification test is successfully completed. Certification of Level II is provided once the material is completed and educator successfully passes trainee. Level III+ certification upon educator successfully passing the trainee. Our hybrid training program is designed to provide a superior experience teaching exclusively, the essence of scalp micro pigmentation. 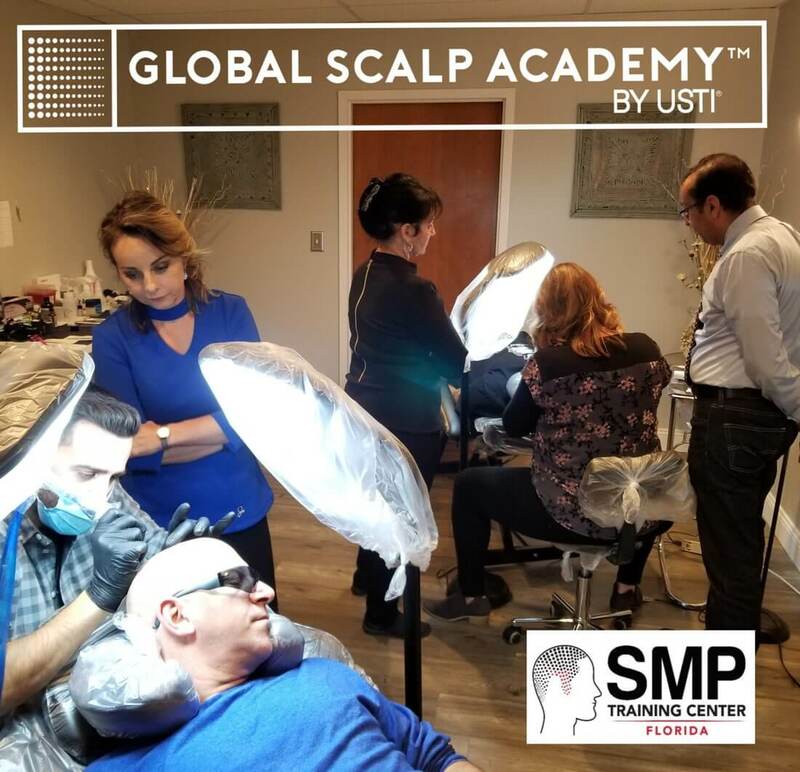 This training includes; a comprehensive online portal, discussing not only SMP but also the in depths of hair loss and trichology education, giving interactive virtual instruction, provided by a top industry professional, followed by a full 4-day training course, given by the top trainers in this up and coming industry. We have the highest standards in the industry, so there is no room for error. Our pre-requisite online portal allows for each student to enter on the same learning level. Given these high standards, students must pass assessments on the first day of class before moving forward to work on live models. The online portion of the training contains the critical fundamental building blocks giving students a basic knowledge of multiple areas from the anatomy of the skin, safety, and sanitation, to needle theory and working through problematic skin. Through interactive response from our trained educators, students will receive basic learning application, practice drills, and guidance on perfecting their skill through a systematic approach. Until they have demonstrated a sufficient level of ability in order to advance. We do require a minimum passing score of 80% on all given exams. In the intense, hands-on portion students work closely with instructors, with a superior student to model ratio. Students are assessed for efficient application and competency of all skills required to complete the safe and effective treatment of clients. Students must provide before and after pictures of at least three completed cases, prior to the end of class, before receiving full certification. Global Scalp Academy prides ourselves on offering superior continued support for all students, ensuring long-term success. Apprenticeship programs are available in select cities across the country. Why train to become an SMP Artist? Scalp Micropigmentation (SMP) is a booming business within the beauty industry, with more and more people requesting the service. Many areas have one, maybe two, poorly trained artists, if any at all. This service can set you far apart from your competition. The average SMP procedure is $3,500, with just two SMP clients a week you will exceed $300,000 in additional yearly revenue! This does not include the endless scar corrections, male and female hair loss camouflaging or sales of hair loss products and devices. This program is for students that want a complete hands-on experience with our Master SMP Artists and Educators. By purchasing this course, you are agreeing to the USTI Terms & Conditions.